Abbott Leads Gillard with Election-Winning Swing to the Coalition! Tony Abbott who won the coalition leadership by one vote opposing the ETS is now in a leading position for the August 21 election according to the latest Neilsen poll . Martin Cohen as part of his fine article Prophets of Doom looks at the wind generation in Denmark which has been held up to the world as a great example of green power in action. As Martin explains the truth is quite different to the hype. Labor has revealed that the five Climate Change "experts" will be paid an average of $300,000 each and these are the people who will brief the Citizen's Assembly who will then find a consensus on the issue. Leading Aussie skeptics Bob Carter and Ian Plimer need not apply , although I would love to see them do so. The gamble by Labor in changing from Kevin Rudd to Julia Gillard and then calling a snap election may be coming unstuck. After the initial honeymoon with Australia's first female PM ,voters now have the two parties at 50% each ,two party preferred ,with the momentum now with the Coalition as damaging internal leaks have blunted the Labor party campaign. Melanie Philips , one of my personal favourites, writes that the Global Warming cult is a middle class phenomenon among people sufficiently high in the Maslow "needs list" that they can afford the time to philosophise about it. Green Power - Western Economies Committing Economic Harakiri. The foundation on which the modern industrial society has grown has been cheap and portable energy. A flick of a switch powers our lights and our homes and electricity powers our industry , manufacturing goods which allow modern living standards far beyond anything contemplated by our ancestors . Tony Abbott narrowly won the first and only election debate according to expert journalists but lost according to the TV worm which seems to gauge very little as the needle swings often before the candidates start talking. However Abbott looked and spoke like an alternative Prime Minister and has put his campaign back on track. The latest Newspoll confirms this with Labor's primary support dropping below the Coalition while they are still ahead on the two-party preferred vote. A major factor in the coming weeks will be the new TV campaign of the junior mining companies against Gillards mining tax which was so damaging to Kevin Rudd. Julia Gillard has vowed to stop the building of inefficient coal power stations in her climate change policy release. JULIA Gillard will ban new coal-fired power stations that use "dirty" technology and require that any power station built can be retro-fitted with developing clean coal technology. The Prime Minister has also committed $1 billion over 10 years to create an “efficient and strongly regulated” national renewable energy market. And, in a speech at the University of Queensland in Brisbane, Ms Gillard has also pledged $100 million to fund market-based projects designed to develop renewable energy technology. “We will never allow a highly inefficent and dirty power station to be built again in Australia,” she said. Wow!This will really upset those authorities feverishly planning to build very inefficient and world's worst practice power stations . Talk about stating the obvious. Ms Gillard said she wanted to ensure that during her search for a national consensus on climate change action that the nation did not “lock in” new power stations or energy sources that would last 30 years and continue to contribute to pollution. She has advocated setting up a Climate Change Commission comprising 200 voters who will be "advised" by "selected" Climate Change "experts". Gee, I wonder what conclusion you could expect from such a set-up as I suppose Dr Bob Carter and Professor Ian Plimer won't get an invitation! More Alarmist Hypocrisy - Please Stop Me From Flying! Timothy Egan in the New York Times flew across the country to Washington to bag Senator Inhofe for not constructing a greenhouse because it is hot in Washington , and to lobby for laws to stop people like himself flying across the country . Prince Charles, that living example of the perils of centuries of Royal inbreeding has attacked climate change sceptics in a speech at St James Palace. Belgium is considering a new process called resomation for dissolving corpses in an eco-friendly way. I suppose we could have a moving ceremony when we pull the chain and send Granny on her way and every year place some flowers at the local sewage-processing plant. A wall erected there where an engraved plaque could be attached would also be a nice touch.They haven't yet arrived at a pit full of lime and a bulldozer for efficient mass disposals but give them time, as anything is posssible in this alternative universe into which we seem to have slipped! Of course you have to look on the bright side because the green bureaucrats have not yet started calculating carbon footprints of Nursing homes or the benefits to Gaia of premature liquefication of the feeble Grannies of this world. Remember the video where a shopper is manhandled by the Green Police for requesting a plastic bag? For UK householders that time has arrived with "green crimes" getting a larger fine than shoplifting! Figures obtained by The Sunday Telegraph have revealed that local authorities issued more than 1,240 fixed penalty notices last year for breaking rules on recycling and putting out rubbish. Councils are issuing fines of up to £110 for such infringements as putting their bins out for collection at the wrong time, over filling bins, or putting recycling into the wrong boxes. That compares to the £80 spot fines that can be issued by police to people caught shoplifting. The controversial rules have been condemned as "draconian" and are deeply unpopular with householders. Councils insist the fines are necessary. They say that wheelie bins left on pavements are unsightly and may cause a hazard to the elderly. They claim they must enforce rules on recycling to ensure the government can meet European targets on reducing the amount of rubbish which goes to landfill. Environmental wardens, nicknamed the "bin police" are sent out to look for infringements and in some cases have rummaged through people's rubbish to inspect the contents or even to find documents linking the rubbish to householders. As well as the fines, local authorities have issued 24,914 official Statutory Notices last year threatening householders with fines. A further 45,010 warning letters were also sent out pointing out breaches in bin and recycling rules. I am reminded of the words of Wordsworth - "Shades of the prison house begin to close about the growing boy" when I see the bureaucratic regulation of our lives increasing inexorably day by day . We are like the frog in the saucepan of warming water - we won't jump out until it is too late! Obama's Uphill Job - Selling Global Warming to a Non-Warming Nation! C3 as usual has an excellent post on the Global non-warming of the US which is contrary to what Obama and the Democrats would have us believe. 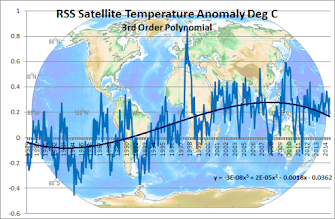 The graphs shown are not from skeptic sources but from NOAA itself - Global Warming Central! Democrats and the Obama administration will attempt just about every falsehood and any misrepresentation in efforts to pass some form of the global warming, cap and trade, energy legislation. As long as the mainstream media refuses to do any fact checking, the global warming B.S. will continue. "If the current rate of heat-trapping emissions continues, by 2070 summers in Boston will feel like those of South Carolina today. By the end of the century, temperatures could rise up to 14 degrees Fahrenheit in the region. Cities across New England, which historically experience only one or two days per year above 100 degrees each summer, could average 20 such days per summer, while more southern cities such as Hartford could average nearly 30 days. The character of the seasons will change significantly. Spring could arrive three weeks earlier, with summer lengthening by about three weeks, autumn becoming warmer and drier, and winter becoming shorter and milder." Okay, based on actual empirical evidence, are any of the above GW claims likely to happen within the next 60 to 100 years. In a word, NO. The linked postings above clearly document the global warming lies (or, if you prefer, the wildly speculative, irresponsible predictions with no basis in reality) on the Democrat's site. An example is the statement that the Northeast region's temperatures may rise 14 degrees by 2100. That claim is so outlandishly bogus it becomes synonymous with an outright lie. In a further examination of the data, the charts below show the impact of the huge amounts of global CO2 emissions on U.S. Northeast regional summer and winter temperatures since 1895. How big was that impact? Well, as the charts depict, just about squat. And whatever squat Northeast warming has occurred is most likely explained by a combination of natural forces and land-use forcings, not human CO2 emissions. And by the way, note both charts reveal 10-year average temperatures (red curve) being higher prior to the 1970's. The amazing thing about the Global Warming scam is that the best temperature-metered country in the world ,the US, has shown virtually no nett warming over the last 100 years and the data clearly shows the nineteen thirties were as warm or warmer than the present. The graphs tell the story. Aircraft like the Solar Impulse are on the cutting edge of technologies aimed at curbing the amount of greenhouse gases that come from flying. Although a pretty toy the Solar Impulse is basically a powered glider with the lawn-mower size engine usually used replaced by a bank of solar panels and electric motor. This type of design has as much commercial application as a chocolate tea-pot but will have greenies all over the world wetting themselves at the prospect of solar powered flight. Putting it in perspective a solar panel can develop up to a maximum of 100 watts per square meter - a commercial 747 uses 140 million watts in normal flight .A solar panel area of 1Km by 1.4 Km would develop that power at midday with the sun directly over-head which would present a few minor aircraft design problems that even the NYT should be able to understand! Mann says Hockey Stick should not have become Icon! You Don't Say! Louise Gray of the Telegraph dutifully reports on Mann's latest comments on the iconic Hockey Stick. Speaking to the BBC recently, Prof Mann, a climatologist at Pennsylvania State University, said he had always made clear there were "uncertainties" in his work. "I always thought it was somewhat misplaced to make it a central icon of the climate change debate," he said. As Steve McIntyre has shown the "uncertainties" were so large that Mann's work was basically only suitable for wrapping the fish and chips. 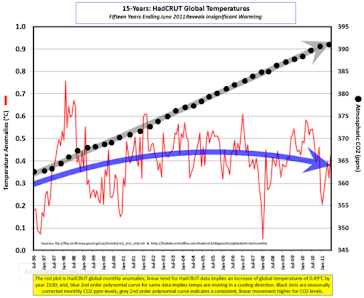 The Hockey Stick was made an icon to remove the MWP, because if the MWP existed as everyone knew it did , the whole idea of "unprecedented warming" was down the toilet, along with the whole Global Warming scam! Another report for the everything causes Global Warming list! It appears that researchers have noticed that the gases used in operating theatres are actually shock horror ,greenhouse gases and should be used with care. Next thing they will notice the bubbles in my cold ale ! Bjorn Lomborg writes that the European response to the alleged Global Warming threat is will cost billions without significant results. Intellectual Sheryl Crow Bags Tea-Partiers as "too uneducated"
Newsmax reports that warming activist Sheryl Crow who is renowned for her advocacy of using one sheet of toilet paper per sitting has said in an interview with CBS that Tea Party members are uneducated,angry and potentially dangerous.